I like to share interesting pieces of figurative language I encounter in my reading. I write today about a series of metaphors from author Susan Orlean…. I have visited Southern California many times, on perhaps as many as a dozen different trips. But I have been to LA only once and I am now desperate to go back again. Why? I want to tour the central branch of the LA public library. 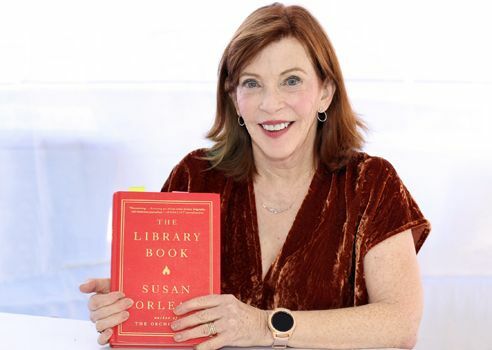 My interest in the building arises solely out of a remarkable book by Susan Orlean (pictured above) called, plainly enough, The Library Book. This work offers a riveting account of largest library fire in US history, which occurred at LA Central Library in 1986. And Orlean essentially took that fire and turned it into a book. One recent warm morning, the people in the garden were clustered under the canopy of trees, and beside the long, trickling watercourse that seemed to emit a small breath of chilled air. Pigeons the color of concrete marched in a bossy staccato around the suitcases. The reading tables and carrels were empty each chair tucked under each table, all enfolded in a quiet even deeper than the usual velvety quiet of the library. The smoke began to coil upward, drifting through the open grating of the shelves like a ghost. At first, the smoke in the Fiction stacks was a pale as onionskin. Then it deepened to dove gray. Then it turned black. It wound around Fiction A through L, curing in lazy ringlets. It gathered into soft puffs that bobbed and banked against the shelves like bumper cars. The temperature reached 451 degrees and the books began smoldering. Their covers burst like popcorn. The temperature reached 900 degrees, and the stacks’ steel shelves brightened from gray to white, as if illuminated from within. Soon, glistening and nearly molten, they glowed cherry red. Then they twisted and slumped pitching their books into the fire. Water sprayed on the fire boiled like a kettle put on for tea. These instant neighborhoods were so uniform that they looked like they had been punched out of a kit, delivered by air, and installed as complete sets. The room is hard-walled and hard-floored; sound ricochets around it like a cue ball. He wears round owlish glasses that, combined with his taste for tidy clothes, make him look like a tenure-track English professor. When we emerged from the dim garage, the sun hit us with a wallop, like a blast from a water cannon. He had a habit of tapping his forehead after being asked a question, as if he had to jar the answer loose from a storage bin in his brain.